Guoman's The Cumberland Hotel, which was the last known address of guitar legend Jimi Hendrix, will thrill music fans and your budding guitar burners with its 60s-inspired Hendrix Suite. Super stylish, contemporary and minimalist in its public space decor, the Cumberland has long had a connection with one of the best known of Hippie era icons. Jimi Hendrix was a regular guest during the 1960s at the hotel conveniently located on Great Cumberland Place, near Marble Arch, Oxford Street and Hyde Park. According to the hotel, he conducted what was said to be his last interview in one of the hotel's fifth-floor suites on September 11, 1970, after playing the Isle of Wight Festival. The interview with music journalist and press agent Keith Altham for the BBC's "Scene and Heard" radio program can be heard by guests staying in the suite. Just days after the interview, Hendrix died of a drug and alcohol overdose. 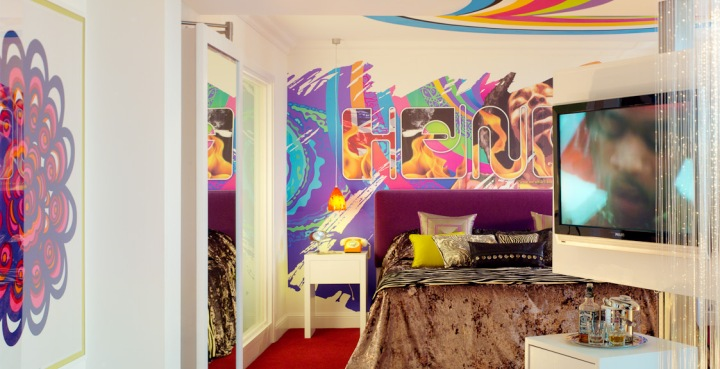 The suite, refreshed and conceived by interior designer Mary Gannon and her team, is decorated in psychedelic patterns, vintage fabrics and even a genuine ‘Flying V’ guitar, painted to resemble the one Hendrix decorated himself. If you're like billionaire Paul Allen, whose fanatic devotion to the Jimi Hendrix Experience inspired the EMP Music Museum in Seattle, you're bound to appreciate the designers' lighting, flamboyant colors and an original 60s printed panel called 'Peacock' by Mariji Isola for Marimekko, along with a wall of framed original New Musical Express covers from the 1960s featuring the rock legend. The Cumberland's futuristic lobby also showcases a couple of archival photographs of Jimi Hendrix taken in the late 1960s by Barrie Wentzell. The hotel itself boasts Carbon Bar with DJs spinning the latest tracks (unlikely Hendrix) and the Patrón tequileria. Restaurants include W1 serving British cuisine and The Market for casual fare. The Cumberland's Hendrix Suite is available to the public; check with hotel on current pricing. The current hotel family specials valid Feb 28, 2013 to Feb 28, 2014 include one honored at any of Guoman's five hotels: 20% Discount on a two-night stay and a 30% discount on three nights. For an August 2013 stay, we found the cost to be £270.98 per night in an Executive Family Room, with breakfast and access to the private Club Lounge, for those who book two weeks in advance. Check with your agent, manager, travel specialist or the Guoman Hotels site for more information and booking.